Sundays in My City is a weekly photo meme that introduces readers to cities and cultures all over the globe. Visit Unknown Mami to learn more. 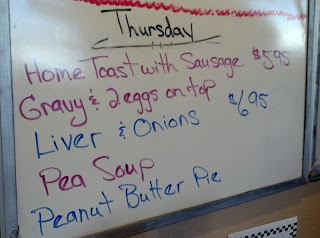 In a tiny town in Wisconsin, there's a tiny restaurant called Memories on Main. Mr.4444 took me there for breakfast Sunday morning. The restaurant has a lot of character. A sweet little old lady greeted us as we entered. The homemade food (which was good) was cooked on a regular stove in a tiny kitchen. The bathroom (unisex) has all kinds of framed front pages from historical events from the past 100 years or so. In the dining area, there's an authentic juke box! 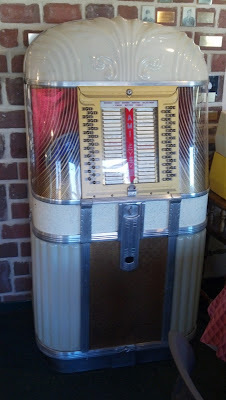 but I did note that it was filled with some very popular hits from back in the day. Paper Roses, by Anita Bryant caught my eye, as did Travelin' Man, by Ricky Williams. and Nezzy, of Cowpatty Surprise write about history and music. a wicker and bamboo motorcycle. it looks like my niece's "base." Is there such thing as a base cello?? thanks for sharing the travelin you did with your man on Sunday. That's a classic from 1961 !! - you weren't even here yet were you? Mrs4444 - thank you for the kind words. I love the photo of the fishing rods, bike and silo. Can't get much more Wisconsiny than that unless you add beer, cheese and football into the loop. Wowie! 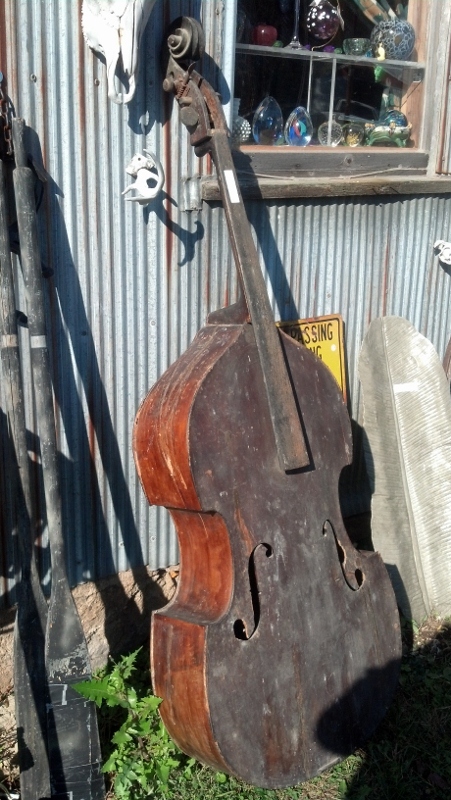 Somebody paid a pretty penny for that stringed instrument at some point in the past! Culture in Wisconsin---I love it all. What a great restaurant. There's nothing better than vintage. 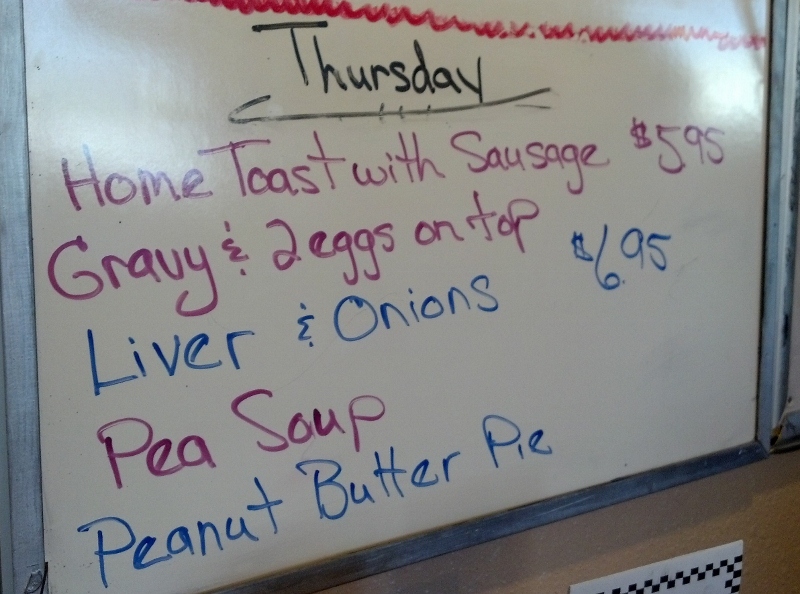 Love the jute box… no so much the liver and onions. Blah! 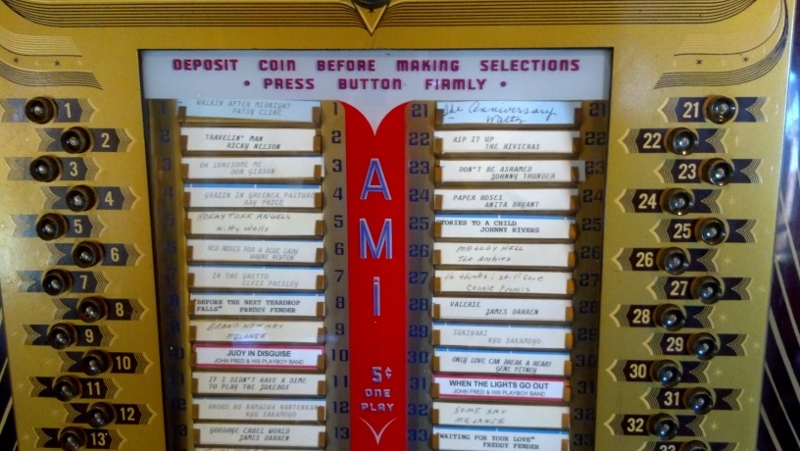 We just returned from Kansas, there is plenty of odd out there in the great USA. Glad to hear you had a good weekend. 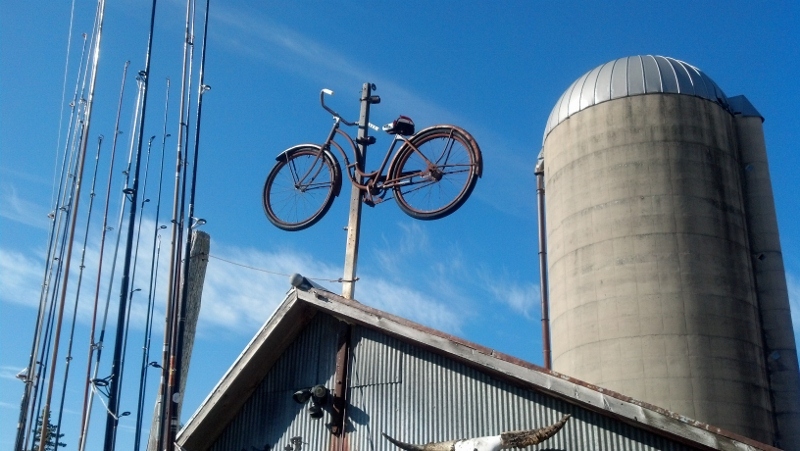 I'm rather fond of the bicycle weather vane! Thanks for reminding me of how much I used to love "Traveling Man". Great song. Looks like you guys had a fun day. 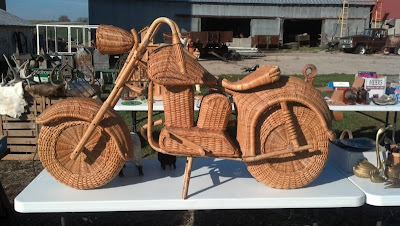 BTW, that wicker bike....crazy!